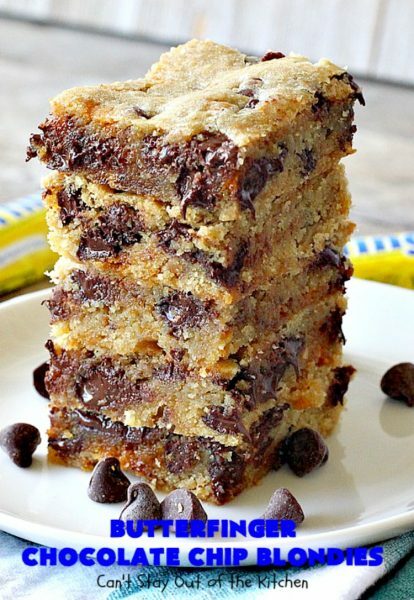 Butterfinger Chocolate Chip Blondies will have you salivating after the first bite! No kidding. If you enjoy Butterfingers, you’ll be like Pavlov’s dogs at the first ding. 🙂 These amazing brownies are filled with Butterfinger Baking Bits and chocolate chips. What’s not to love about that combo? 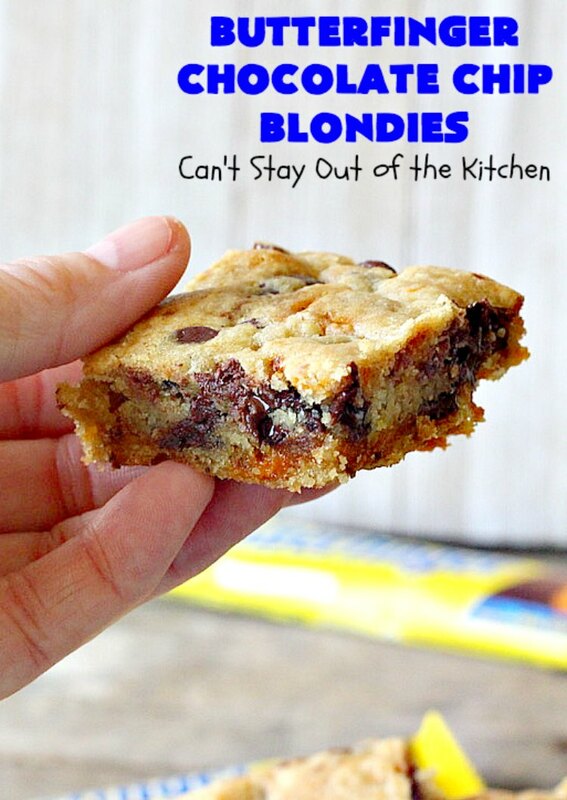 I baked them in a 13×17″ cookie sheet so they made up 48 brownies in all. 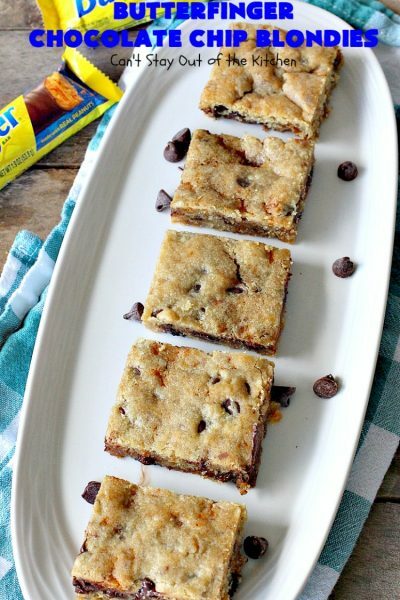 These bar-type cookies are rich, decadent and oh, so delicious. Every now and then when I’m cruising down the baked goods aisle at the grocery, I pick up new and exciting chips to fill cookies. That’s where I found those cool Hershey’s S’mores pieces and these wonderful Butterfinger Baking Bits. I don’t buy them for anything special. I just pick up bags of the stuff so I have them on hand when inspiration hits and I’m ready to use them up. (Usually in a week or two). 🙂 I like to have stuff on hand “just in case” I get in the baking mood. (Which is really pretty often). I also like to keep my freezers stocked with cookies or brownies. We give them away almost weekly to friends, coworkers, neighbors, trustees and others John comes in contact with. Everyone love our cookies. 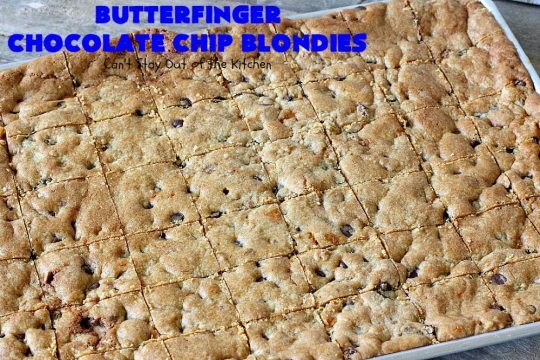 Almost anytime I come in contact with people who’ve received them, we get rave reviews about how much they enjoyed the cookies or brownies. I actually made four batches of these blondies when I was baking them. I highly recommend them for tailgating or office parties, potlucks or backyard barbecues. They’ll be a hit with everyone, young and old alike. An older woman and her husband received one of the eight containers I froze. I got a hand written note [yes, people still write notes!] 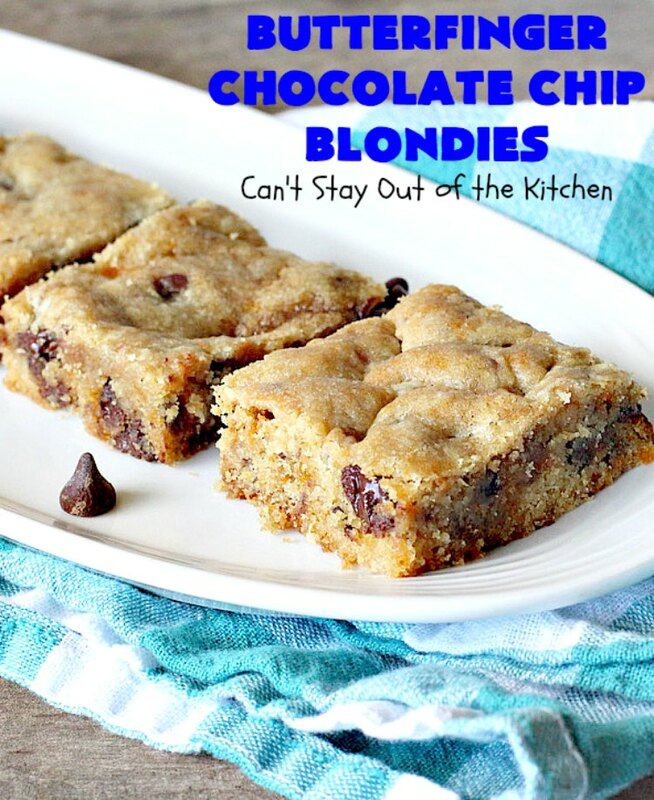 from her about how much they enjoyed these delicious blondies. 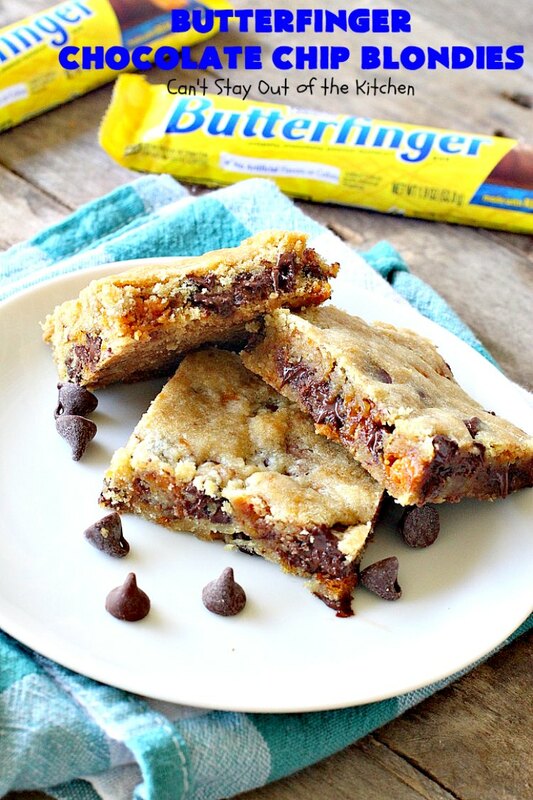 Butterfinger Chocolate Chip Blondies are ooey, gooey and delicious. 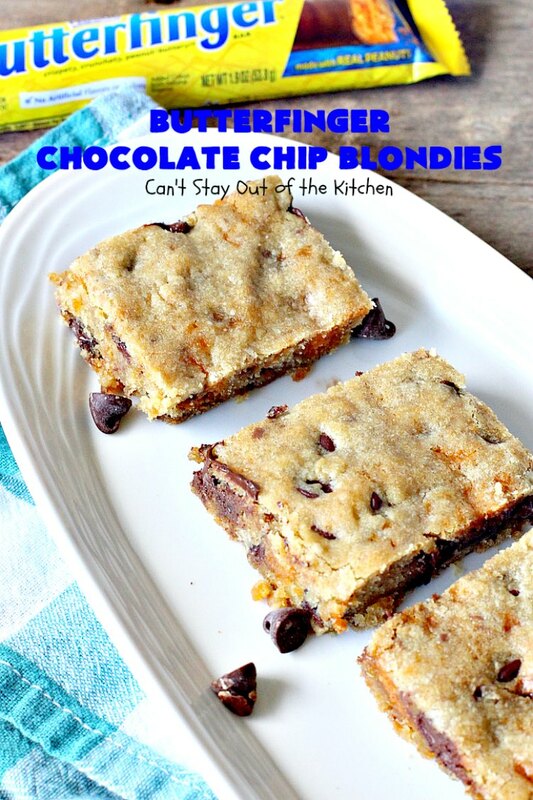 These blondies just explode with chocolate! Yum. Soften butter. 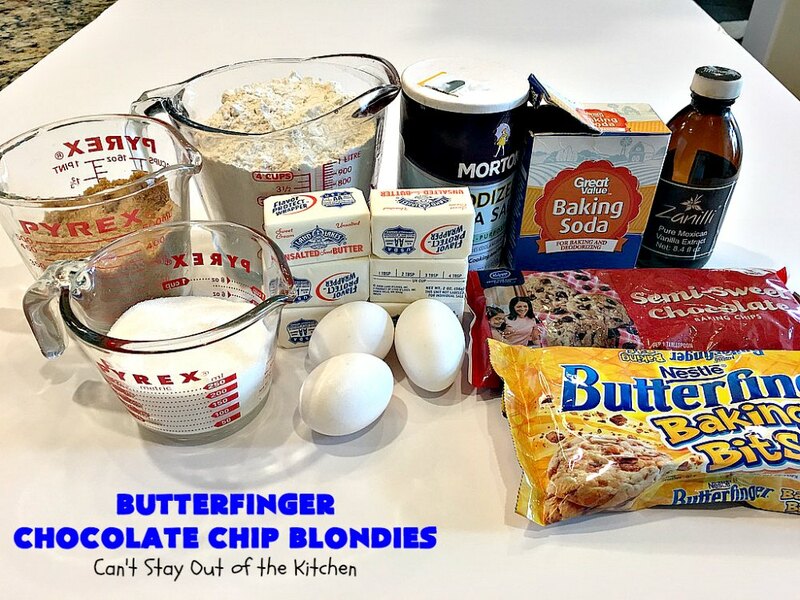 Add eggs, sugar, brown sugar, vanilla, salt and baking soda. Add UNBLEACHED all-purpose flour. Bleached flour toughens baked goods. 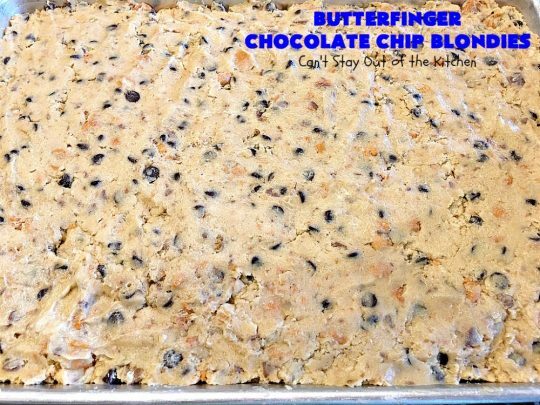 Add chocolate chips and Butterfinger Baking Bits. Stir ingredients with a wooden spoon until well combined. Grease a 13×17″ cookie sheet. Pat dough into prepared baking sheet. 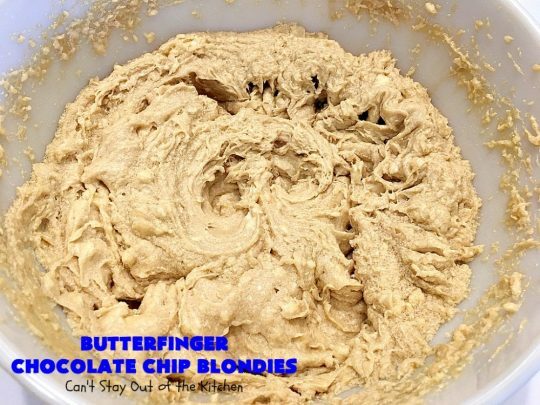 (You may have to keep your hands slightly moist if the dough is sticky). Bake at 350 about 30-40 minutes or until a toothpick inserted in center comes out clean and blondies are set. Butterfinger Chocolate Chip Blondies are perfect for tailgating or office parties. These brownies are packed with chocolaty flavor. We loved them. 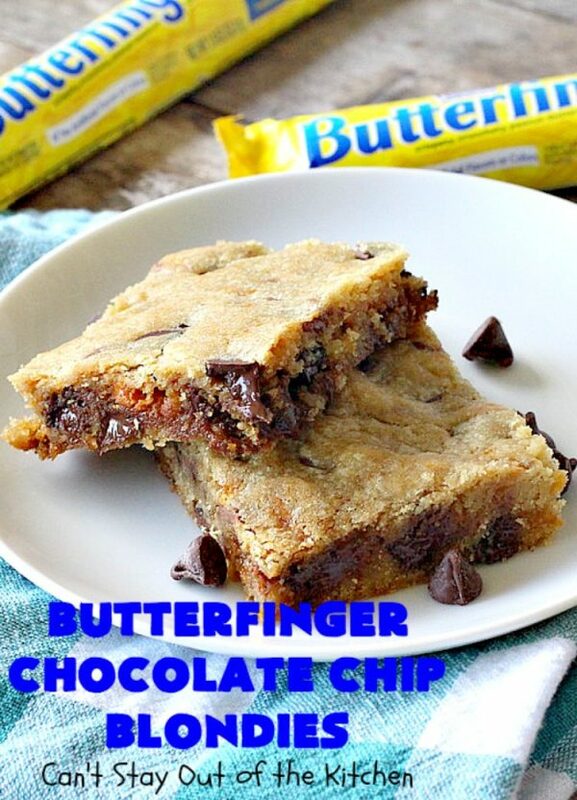 If you enjoy Butterfingers, you’ll rave over this dessert. 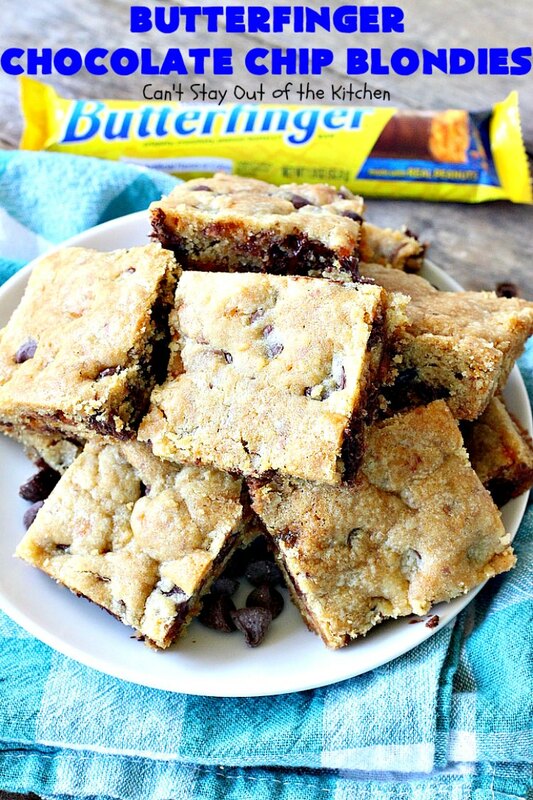 These spectacular blondies are filled with chocolate chips and Butterfinger Baking Bits. They'll knock your socks off! Perfect for holiday, tailgating or office parties. Grease or spray a large 13x17” cookie sheet with cooking spray. 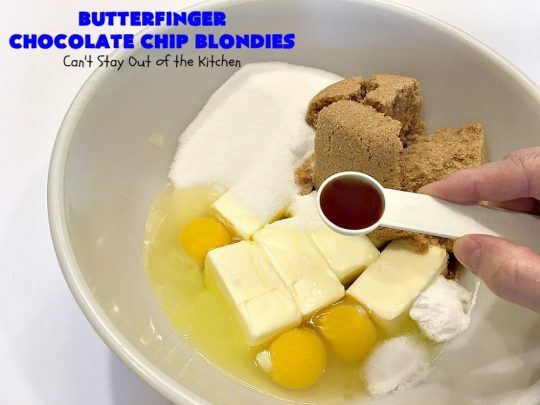 In large bowl, combine butter, sugars, vanilla, eggs, salt and baking soda. Beat at medium speed with an electric mixer until fluffy. 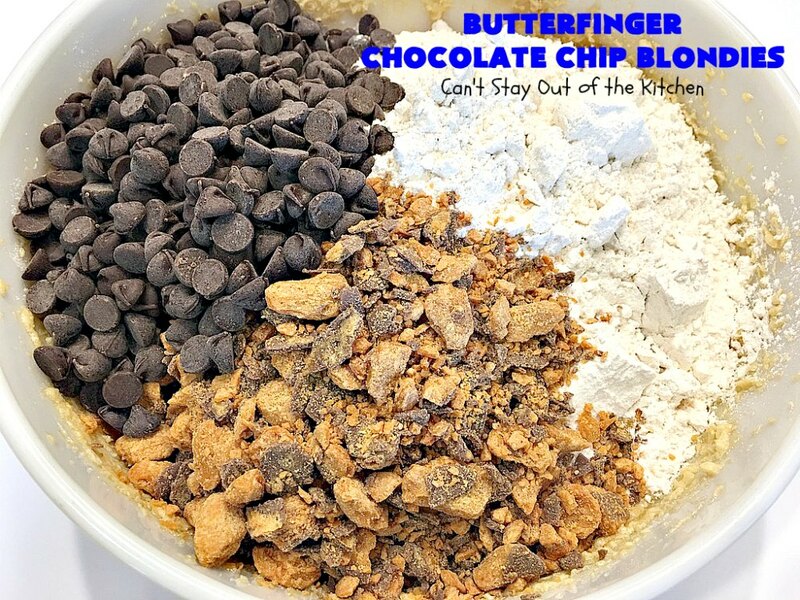 Stir in flour, Butterfinger bits and chocolate chips with wooden spoon until combined. 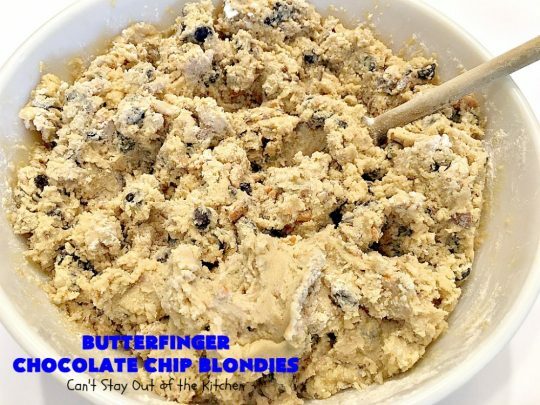 Spread and press down cookie dough into prepared cookie sheet. Bake at 350 for 30-40 minutes, or until lightly browned and a toothpick inserted in center comes out clean. These brownies are so delectable they’re hard to resist. You may find these items helpful for making this post.